Olympia (Greek: Ολυμπία Olympí'a or Ολύμπια Olýmpia, older transliterations, Olimpia, Olimbia), a sanctuary of ancient Greece in Elis, is known for having been the site of the Olympic Games in classical times. Looking at the ruins as they stand silently among the low trees at Olympia, it is not hard to imagine how the Olympic Games cultivated the collective consciousness of the Hellenes. In ancient times, Greek men from all corners of the Mediterranean made the pilgrimage to Olympia to pay tribute to Zeus, to forge friendships and alliances, and to enjoy or compete in poetry, music, and athletic events. In the twentieth century, the role of Olympia in generating this spirit was somewhat revived with the introduction of the Olympic Torch relay, in which the torch is ignited several months before the opening celebration at the site of the ancient Olympics in Olympia. Olympia was designated a UNESCO World Heritage Site in 1989. A further revival of Olympia occurred in 2004, when Athens hosted the Olympic Games and the shot put competitions were held in the restored Olympia stadium. With a renovated museum and other facilities, Olympia has become a popular tourist attraction, allowing the world to experience and appreciate aspects of ancient Greek culture exemplified in the Olympic Games at their original site. Olympia was inhabited and growing as far back as Mycenaean times, when it was used as a place of worship, with buildings and relics dating as far back as the Geometric period and early Archaic period. The Olympic festival took place every four years over a five-day period in the late summer during a sacred truce, observed by all Greek cities. It was comparable in importance to the Pythian Games held in Delphi, the Nemean Games of Nemea, and the Isthmian Games of Corinth. Official records date the first Olympic Games as having been held in 776 B.C.E., when Koroibos, a cook from the nearby city of Elis, won the stadion race, a six hundred foot long foot race. Contrary evidence, both literary and archaeological, suggests that the games may have existed as a local festival at Olympia much earlier, perhaps as early as the tenth or ninth century B.C.E. The celebration of the Olympic Games, usually hosted by the Eleans, was an occasion for citizens of scattered Greek city-states to assemble. There they discussed important political issues, celebrated common military victories, and even formed political and military alliances. However, they were also the cause of political conflict; control of the Sanctuary and the Games brought with it prestige, economic advantages, and, most importantly, political influence. One notable example was the invasion of the Arcadians in 364 B.C.E., which resulted in a battle in front of the spectators. As Olympia was eventually secured by the Arcadians, the Eleans declared the year 364 B.C.E. Anolympiad. Although the Olympics continued to enjoy a measure of prestige, the varying political and economic changes of the Hellenistic and Roman periods affected both the site and the games. City-states plundered Olympia to fund their wars until the games themselves were abolished in 394 B.C.E. by Emperor Theodosius I for being reminiscent of paganism. Theodosius II ordered the temples at Olympia to be destroyed 30 years later and a Christian basilica was constructed there. Eventually, earthquakes and landslides decimated Olympia, and repeated flooding of the Alpheus and Kladeus Rivers buried the site. This vast site went missing for almost a millennium before its rediscovery and excavation from under 16 feet of yellow silt. Excavation of the Olympian temple district and its surroundings began with a French expedition in 1829, and was continued by German-born archaeologist Ernst Curtius. Curtius was extremely systematic in his work. In the period from 1875 to 1881, almost the whole of Olympia was unearthed, revealing some of the most beautiful artistic pieces of ancient Greece. Besides numerous coins and inscriptions, Curtius also found the well-preserved statue of Hermes carrying the infant Dionysus by Praxiteles. Curtius also found the temple of Hera, the altar of Zeus, the former site of the enormous statue of Zeus (one of the Seven Wonders of the World), and the original location of the Olympic stadium, where the Olympic Games took place in ancient Greece. The scientific expedition—the largest of its kind at the time, and one of the largest ever carried out—was funded by the German government under the direction of Curtius and with the assistance and support of the best archaeologists of the period, including Friedrich Adler and Wilhelm Dorpfeld. After six years of excavation, most of the buildings reported by Pausanias had been cleared and identified, including the Heraion, the Temple of Zeus, the Metroon, the Philippeion, the precinct of Pelops, and the Echo Colonnade. Artifacts from the expedition were to remain in Greece, according to the contracts drawn up between the Greek and German governments, but most of the largest statuary had been looted in antiquity, for the most part by the Romans. The Palaestra, dating to the third century B.C.E., was used as a place for social meeting, practice, and training. Its four sides were lined with Doric columns and beyond were various rooms with Ionic columns in which the athletes prepared for competition. A cistern in the northeast corner provided cold baths. An unusual feature of the Palaestra is the strip of concrete pavement on the north side of courtyard, which is formed with alternate bands of ribbed and smooth tiles arranged to create continuous ridges stretching the length of the pavement. This was probably a sort of bowling alley, as suggested by a similar pavement found at Pompeii with heavy stone balls on it. The Temple of Zeus, situated in the center of the Altis, was the work of the architect Livona. Standing on a platform, the temple is in the Doric peripteral style with impressively decorated pediments. The temple was built in the mid-fifth century B.C.E., funded by the spoils of war won by the Eleans from Pisa. The temple was richly decorated with statues, including the great statue of Zeus. Winners of the Olympics were crowned at the entrance of the temple. The Temple of Hera, also known as the Heraion, was a Doric styled temple. Originally made of wood, the pillars were later replaced with stone ones. It was constructed in the seventh century B.C.E. and hosted the statues of Zeus and Hera sitting on a throne. Though originally dedicated to both Zeus and Hera, it later became Hera's exclusive temple after the establishment of the Temple of Zeus. The Stadium underwent three phases of transformation in order to accommodate a growing throng of dedicated fans; the third and final stadium dates back to the fourth century B.C.E. Though the stadium had no seats, its banks could hold up to forty thousand spectators. All around the track is a duct with basins, dating to the second century C.E., which supplied the spectators with water. An altar to Demeter was placed on the northern bank, where the priestess of Demeter, the only woman ever allowed to view the games, was permitted to sit. The Hippodrome once lay to the south of the Stadium, but has now been washed away by the Alpheus River. The renowned horse and chariot races were once held there. The Bouleuterion was the place where the Olympic Senate met and official documents were stored. The southern side of the building dates to the sixth century B.C.E., while the northern portion dates to the fifth century B.C.E. In between these two sections is an open space in which the altar of Zeus Horkeios stood, at which competitors, along with their families and trainers, swore that they would abide by the regulations of the games and not cheat. The Philippeion at Olympia was a circular, temple-like structure of stone and marble which was started by Philip II of Macedonia after his victory over the Greeks at Chaeronia in 338 B.C.E. as a donation to the Greek gods and proof of his Greek lineage. It was reportedly completed by his son, Alexander the Great. It featured a peristyle and an inner colonnade of nine Corinthian half-columns around the wall and a roof of carved marble tiles and crowned with a bronze poppyhead. The Leonidaion was donated by the architect Leonidas in 330 B.C.E., who was from Naxos. This particular building had rooms on all four sides. These rooms were intended for the hospitality of officials, celebrities, and visitors. Roman dignitaries made it their home during the Roman years. The Workshop of Pheidias was built to house his work on the chryselephantine statue of Zeus. In and around the workshop, tools, terra-cotta molds, and other artifacts related to the work of the artist have been found, including a cup bearing his name. In the mid-fifth century C.E., a Byzantine church was built on top of the workshop. The Gymnasium was a rectangle building with an internal courtyard and arcades in the four sides. It was built in the second century B.C.E. and its size was most useful for athletes that required space for their training, most notably in such events as the javelin and the discus. The Treasuries to the north of the Altis and west of the Stadium housed votives and offerings of various Greek cities and colonies. The oldest and largest treasury is the Gela treasury, dating to circa 600 B.C.E. West are the treasuries of Megara, Metapontum, and Selinus. Next is an unknown structure, perhaps an altar to Gaia. Further west are the badly ruined Cyrene, Sybaris, and Byzantium treasuries; then the Epidamnos, Syracuse, and Sikyon treasuries. The Prytaneion was built in the sixth century B.C.E. In this building, official guests and the winners of the Olympic Games were served feasts. The altar of Hestia, where the eternal flame from the original Olympic Games once burned, was housed in this building. Traditionally, the Olympian priests would mix clay, water, and ashes from the altar and smear them on the Great Altar of Zeus once a year. Phidias created the 40 foot tall statue of Zeus at Olympia about 435 B.C.E. 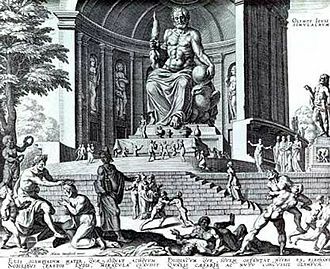 The statue was perhaps the most famous sculpture in ancient Greece, imagined here in a sixteenth century engraving. Olympia is well known for the gigantic ivory and gold Statue of Zeus at Olympia that was situated inside the Temple of Zeus. Sculpted by Pheidias, the statue stood at approximately 40 feet in height and was named one of the Seven Wonders of the Ancient World by Antipater of Sidon. The statue depicted Zeus with a silver olive wreath on his head, sitting on a throne made of marble and decorated with carvings. On his right hand he held Nike (his personal charioteer and the goddess of triumph), while his left hand bore an eagle on a scepter. The statue was transported to Constantinople in 395 C.E., where it was completely ravaged by the great fire of Ippodromo in 475 C.E. The Archaeological Museum of Olympia exhibits a vast collection of artifacts recovered from excavations of Ancient Olympia, including terra-cottas, sculptures, bronzes, and offerings made during the Games. The Louvre Museum also has a collection of bronzes and architectural reliefs from the 1829 excavation. Looting forced the Greek government to stop the excavation, though it was eventually restarted and is being continued to this day by the German Institute of Archaeology in Athens and the Ephorate of Antiquities in Olympia. The sculptured Ornaments from the Temple of Zeus are on display at the Archaeological Museum of Olympia and date back to the first half of the fifth century B.C.E. Totaling 42 figures, these include figures from the two pediments of the temple, figures from the 12 metopes, and the lion-headed water spouts that ran along the lengths of the temple. The eastern pediment depicts the chariot race between Pelops and Oinomaos, and the central figure which dominates the work is of Zeus. The western pediment depicts the abduction of the Lapith women by centaurs, and has Apollo as its central figure. The metopes bear the relief representation of Hercules' labors. 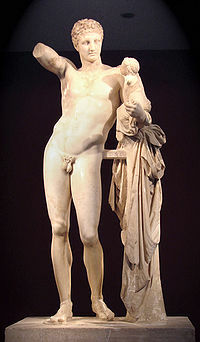 The Hermes of Praxiteles was recovered from the Temple of Hera. The statue, depicting Hermes bearing the infant Dionysus, was made from Parian marble, known to be white and semi-transparent, and stands almost seven feet in height. It is exhibited in the Archaeological Museum of Olympia. The Nike of Paionios, dating back to around 420 B.C.E., was a statue dedicated by the Messenians and the Naupactians for their victory against the Spartans. Made of Parian marble, known too for its whiteness and semi-translucence, it has a height of almost seven feet, but with the tips of her (now broken) wings would have reached almost ten feet. In its completed form, the monument with its triangular base (nearly 29 feet high) would have stood at the height of 35.8 feet, giving the impression of Nike triumphantly descending from Olympus. The Nike of Paionios is exhibited at the Archaeological Museum of Olympia. Many legends abound concerning the origins of the Olympic Games. According to one, it was Hercules who began the games. Having agreed to clean King Augeas's stables in exchange for one-tenth of the king's cattle, when King Augeas did not fulfill his promise, Hercules returned to wage war. He sacked the city of Elis and eventually instituted the Olympic Games to honor his father, Zeus. Another myth tells the story of Pelops, who challenged the King of Pisa in order to win the hand of his daughter, Hippodamia, in marriage. By sabotaging the king's chariot before the race, Pelops won Hippodamia for himself and established the Olympic Games to celebrate his victory. The ancient Olympic Games came to be revived through the efforts of Baron Pierre de Coubertin of France in the late nineteenth century, opening in the summer of 1896 in Athens, Greece. Not well publicized and overall a dismal production, the popularity of the Olympic Games nevertheless gradually grew through a history of boycotts, wars, and political conflicts. By the end of the twentieth century, the Olympics attracted athletes from around the world to match skill and endurance in a series of new and old events, fostering the ideal of a "sound mind in a sound body" and to promote friendship among nations. The idea of the Olympic torch, or Olympic Flame, was first inaugurated in the 1928 Olympic Games in Amsterdam, and was expanded to a torch relay for the 1936 Olympic Games in Berlin. The tradition continues, with the flame being lit at Ancient Olympia and carried by various means to the Olympic stadium of the host city, where the lighting of the Olympic Cauldron signals the official start of the games. Aside from its significance in the torch relay, today Ancient Olympia enjoys much attention from tourists. The site itself is idyllic and green with lush trees and surrounded by the Alpheus River and its tributary, the Kladeus River. The Greek government also outlined ambitious plans to rebuild the greater Olympia area to included roadwork, museum renovations, and sports facilities, which were finished in 2004, the year Athens hosted the Olympic Games. The men's and women's shot put competition was held at the restored stadium in Olympia. Hellenic Ministry of Culture. The Archaeological Museum of Olympia. Retrieved June 20, 2007. Hirst, Kris K. Curtius’ Excavations at Olympia, Greece. Retrieved June 20, 2007. Prefecture of Ilia. Ancient Olympia. Retrieved June 20, 2007.